If you’re concerned about taking the ACT, whether because you don’t need to or because you can’t afford to, there may be hope. ACT waivers are available for both the fee and the test itself. To claim this waiver, however, you’ll have to write a letter explaining your circumstances. Here are our best tips for making it stand out. Additionally, you can check out our college board application fee waiver. The American College Testing (ACT) is a standardized test that many colleges in the United States use for their admission process. It consists of multiple choice tests and it aims to measure the student’s general education and how capable are they to enter college. Since its score provides a measure for colleges to see how capable a student is to enroll in their courses, you can imagine there is a lot of pressure when you take this test. The ACT is among the most popular tests for college admissions in the United States. It consists of four sections: reading, writing, mathematics, and science reasoning. Each of these is ranked on a 36-point scale, and a composite score is then given averaging the skills. There is an additional optional writing section which some universities may require. It’s available at multiple times during the year worldwide and is an important part of admissions to an American university. If your circumstances allow a waiver of the fee or the test, here’s how to get one. What Is the Good ACT Score? The ACT score goes from 1 to 3, being 36 the high mark someone can get. The average ACT score is 20.80. So we can say that anything above 21 is considered a good ACT score. The average score for the test is measured by the different components of the ACT – English, maths, reading, science and the optional writing test. But, if you do not perform well under pressure, or if you are going through a hard time, you can ask for an ACT waiver. 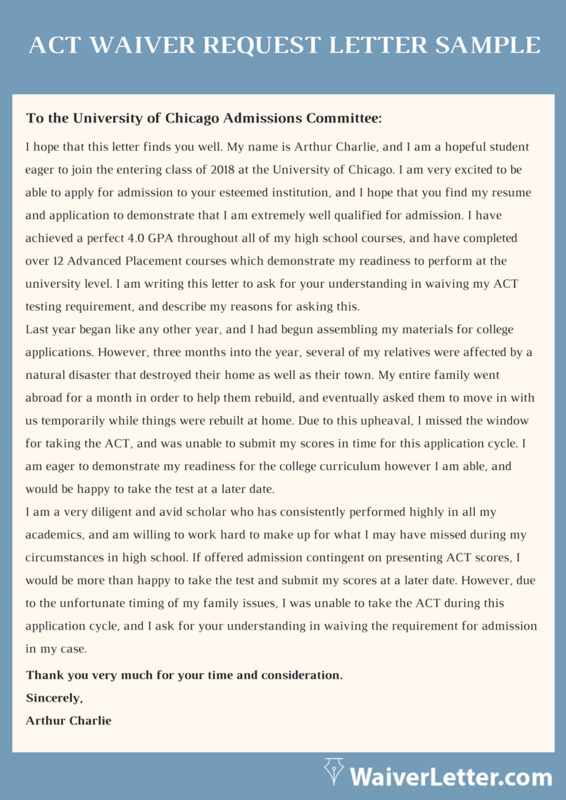 To request it, you will have to write a waiver letter that explains why the admission board should grant you that request. To convince them, you will have to present evidence to support your claim. 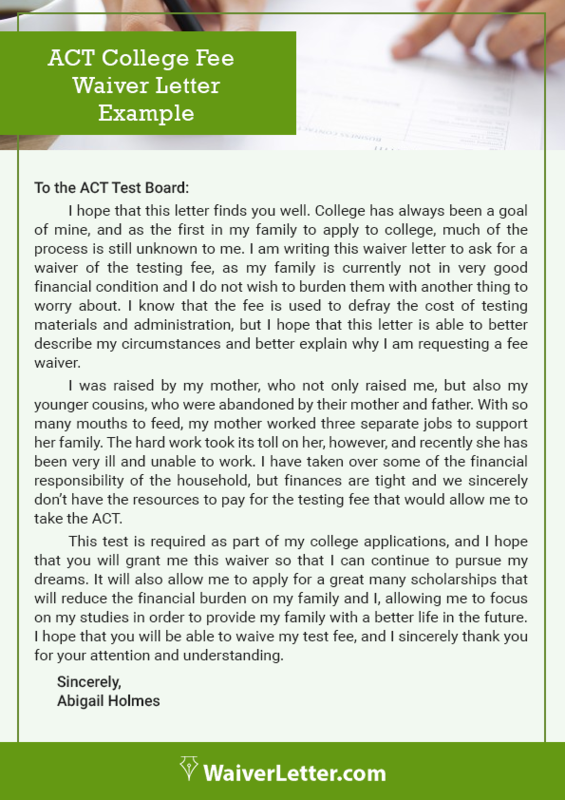 The purpose of the ACT waiver letter is to accept the student’s resignation to their right of presenting their ACT score. Follow this simple outline and you’ll have a great ACT waiver letter by the time you’re done. Skip down two lines, and list the name and address of the person you’re writing to. Two more lines down, write a greeting – generally, ‘Dear [Name],’. Don’t use ‘to whom it may concern’ – it makes a bad impression. Skip down a line and write your introduction, stating why you’re writing the letter and what your request is. Skip down one more line and write your body. This should be one or two paragraphs with supporting details for your request. Add one more short paragraph thanking the reader for their time. Skip two lines and add a closing such as ‘Sincerely’ or ‘Regards’. Four lines below, type your name. Print the letter and hand-sign it in those four lines. Create an outline: This helps you be sure you’re in the right direction. You’re welcome to use the one we just gave you. Be concise and complete: Don’t include too much detail, but don’t leave out important stuff, either. Be upfront: State the most important information first. Get it proofread: You want to look professional, not sloppy, so get someone who can read the letter over and catch mistakes. Understand requirements: Make sure you know whether and why you’re eligible for a waiver before you write. When writing a tuition assistance waiver you should watch some things. It doesn’t matter if you are writing an ACT waiver letter or an ACT registration fee waiver letter. Both of them should follow the same format. The type of language you use is a vital thing to look after. You need to be able to express your request using formal language while persuading the reader to grant you your petition. Another top thing to watch for, if the format you follow. Using a template can help you ensure your waiver letter has the right structure. Leaving any type of error on your waiver letter can have negative effects on your requests. Revising your letter once you have finished is key to make sure you have not left any mistakes. You can read it several times, from end to beginning or out loud, to help you spot those silly mistakes you may have made. The first step is to make sure you know the exact reason why you are writing a waiver letter. You will need to describe it and ensure your message is delivered the way you intended. The second one is to write your waiver letter using strong arguments. You need to persuade the reader to accept your waiver. The third step is about the language you use. Make sure you always treat the reader with respect by using formal language. The fourth one is to provide evidence to support your arguments. You can attach hard copies from your medical certificate or bank statement, or write names and details that will help you convince the reader. And last but not least, always remember to revise your letter before you send it. You may have made some silly mistakes or miss a punctuation mark. Reading it once you have finish writing, will help you make sure your waiver letter is perfect. If you need to write a waiver letter, but you are struggling with the type of language you have to use or the format you should follow, do not worry. Our team is here to help you. Our professional writers are specialized in waiver letters, and they have many years of experience writing this type of documents. They will revise your request and make sure they tailor a letter according to your needs. Our professional writers will craft, write, and polish a winning waiver letter. They will ensure they use the appropriate language, as well as to include strong evidence to raise your case. Our writers know how to write persuasive letters so you can be sure your waiver will have an opportunity to be accepted. Once our writers have finished with your letter, our professional editors will proofread it. They will revise your waiver letter to make sure it contains the relevant information the reader needs to make a decision. Since our professional team is specialized in various fields, we can help you write different types of waiver letters. The most common ones we work with are: GMAT®, LSAT®, GRE®, MCAT®, GPA, IELTS®, PET, TOEFL®, CLEP®, SAT, ACT, VISA, Fee and many more! We have the proven our reputation in writing waiver letters over the years, most of the writers have been working here for at least 3 years. For the best ACT waiver letter help, contact us now and let us ease your stress!